"Because of the failure of the Tritium class, concern for defence capabilities results in the building of an advanced prototype battle cruiser. This ship doesn't become part of the fleet, but many of its improvements do." 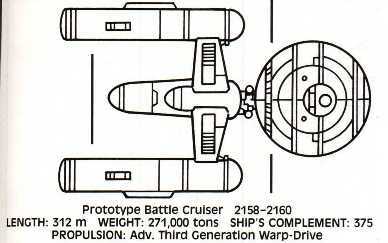 The 2210 Battle Cruiser was another attempt to produce a front line combatant. Again the design was excellent in principle, but was again found to be underpowered. This time however the basic design (in terms of systems) was used, as it was integrated into the design of the Quetzalcoatl class semi Dreadnought.